"There's never been an opera like this; a mixture of things that people really said, and poetry." Director Jon Else has done documentaries about opera (Sing Faster: The Stagehands' Ring Cycle) as well as about the atomic age (The Day After Trinity), and with this 2007 doc he marries the two into a bizarrely compelling combination. Wonders Are Many: The Making Of Doctor Atomic chronicles the history of J. Robert Oppenheimer and the development of the atomic bomb alongside the rehearsals and backstage drama of the complicated stage production of Doctor Atomic, which here is being readied for its debut at the San Francisco Opera. The opera is set in the 24 hours leading up to the Trinity tests in Los Alamos, with inventive composer John Adams and spiky-haired director Peter Sellars are staging arias that use actual dialogue spoken by key historical figures (such as Oppenheimer, Robert Wilson, Gen. Leslie Groves) to retell the tale. On one hand there's the fascinating dark history, tracing Oppenheimer and the bomb development, presented via archival film clips and documents with ominously deep-voiced narration from Eric Owens (who plays Gen. Groves in Doctor Atomic). Oppenheimer is presented as a brilliant and complex character, referred to as a "left-wing intellectual", charged with the unenviable design of what is probably mankind's most heinous weapon. Else has resurrected some rare footage, including an eerie Oppenheimer interview that is chilling in its doomsday logic, and an opening montage of atomic bomb blasts that all avoid the trademark mushroom cloud image. Legendary theoretical physicist Freeman Dyson lays out a succinct explanation of the "how it all happens" chain reaction during an explosion, and Else allows him to expound on what might have happened if the 09/11 terrorists had used bombs instead of planes, which then leads to Owens' narration describing in graphic details the destruction and devastation in Hiroshima. That's really enough for one film, but then there's the entire Doctor Atomic opera component, which is just as critical to Else as the history. Adams and Sellars struggle with music and staging, with Else there for rehearsals and the design of the all-important bomb prop. It's perhaps a little odd to here folks singing about "faulty detonators" and "the most powerful men in Washington", but as the production begins to come together it slowly shifts from weird to engaging. Else avoids showing much of the finished opera, so all that is really shown is fragmented bits here and there, which only furthers the out-of-context sensation for some of the passages. Things like a sudden last-minute cast change adds to the backstage drama, but it is the sweeping creative challenges that continually twist Adams and Sellars to push forward, as opening night approaches. In the end, Else handles his telling of the operatic elements much like the creative team of Adams and Sellars would ultimately have to do onstage. It is the lead-in, not the payoff, that is important, and while Sellars must wrestle with how to handle the inevitable bomb blast that the story seems to demand, Else also takes the artistic high road. He closes his doc with a fairly unconventional long shot that focuses on just one individual, and as viewers we are also forced to see more in our minds than what is really there. Image Transfer Review: Docurama's 1.78:1 anamorphic widescreen transfer is plain, with generally acceptable fleshtones, considering much of it shot under diverse conditions. Else shot much of it handheld, and per the commentary admits he wished he had used better lighting at times, so between that and the archival film and photos then there's little room to condemn the transfer as much as the slighlty rough edges of the original source material. Audio Transfer Review: The single audio track is delivered in 2.0 stereo, and given that this doc is largely talking heads and voiceover the presentation is largely trouble-free, with minimal flair. Voices are clear, especially the basso profundo narration of Eric Owens, which comes off with a fine sense of depth. The occasional operatic moments�mostly done during rehearsals�also sound clean, with no sense of distortion. Extras Review: Not a whole lot here�supplement-wise�with the only measurable bit being a commentary from director Jon Else. The good news is that it's a pretty solid adjunct, with Else discussing the complicated interweaving of the three distinct narratives used in his film. Plagued in a few spots by some lengthy silent gaps, the material provides a fair amount of background on how he wanted to work on an atomic scale, making a film about people "who are good at what they do". Also included is a text bio of Else, the film's theatrical trailer and the same old set of four Docurama trailers that seem to show up on every release of theirs. The disc is cut into 18 chapters, with no subtitle options. 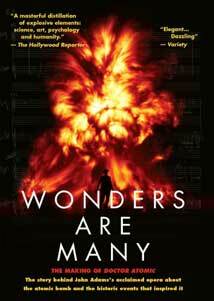 Wonders Are Many is as unusual as it is fascinating, being part history lesson, part making-of an unconventional opera. Director Jon Else is no stranger to the subject of the atomic bomb, and he neatly juggles three separate narratives into a compelling package that combines together developing weapons for civilian slaughter and offbeat arias about faulty detonators. Curious, disturbing and cool, this is an easy recommendation for documentary fans.